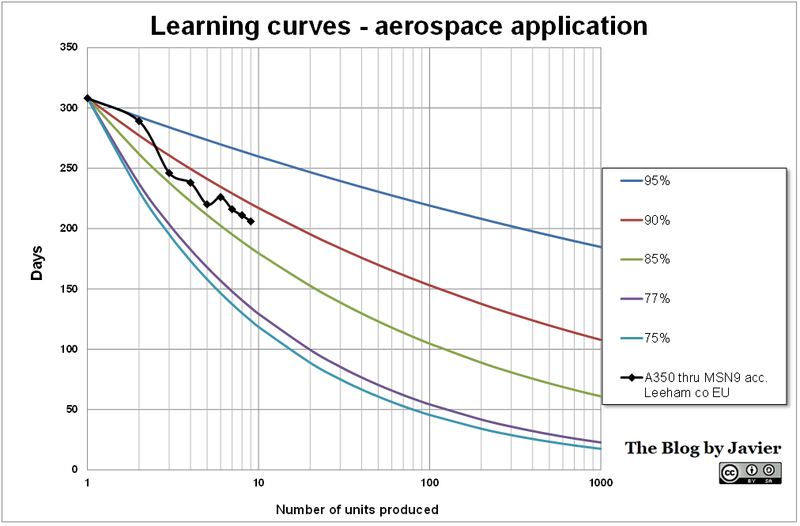 In a previous post I made an introduction of the concept of learning curve and the gains that can be achieved through experience, with the focus on aerospace industry. A350 days in FAL as reported by Leeham News (Reprinted with permission by Leeham Co). It is important to bear in mind the units used in this calculation are days. Days of assembly are linked to unit production costs, but not necessarily in a linear fashion, as it will depend on the labor / automation being employed in the production of each unit, which may change as production evolves. It is also important to note, that the example of learning curve calculated would refer only to assembly at FAL and not to the overall production process, from material costs, production at earlier stages of the manufacturing process, etc. The value added at FAL is but a minor percentage of the value of an airplane. I leave for a following post a case in point 2, with the learning curve of the 787 during 2013.